Shown on the right is a wrought iron hanging sign,with a warning "Beware of Dog". 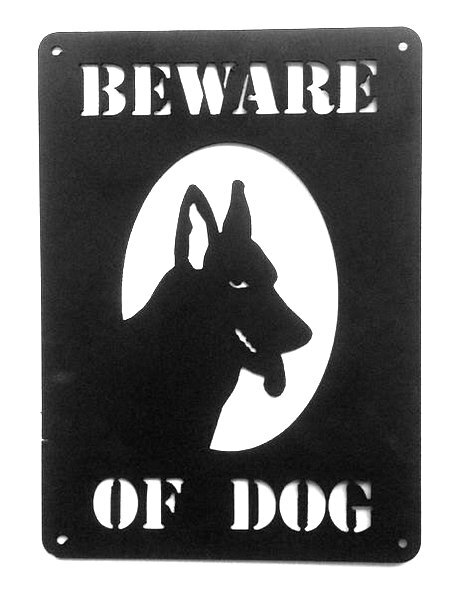 This wall sign is a cut- out of a silhouette of the head and face of a German Shepherd. We precisely cut silhouette signs like these with our water jet cutter, which is computer controlled. After cutting, the sign can be metal-coated with bronze, brass, copper, stainless steel, or rusty iron, or alternatively it can be painted in a variety of colors. Also, it can be sandblasted in some areas to produce contrast for features of the image. This plaque is 2D but we can also weld on overlays for a 2.5D (flat relief) look. To see prices or get Estimate and Order forms , click on gray boxes in upper left margin. Click on dark gray tabs on the header to see Home and other informational pages. Click on one of the light gray numbered boxes in the lower left margin to see other photo galleries.